In Italy there is no fundraising “conference” – no dull meeting of people saying the same old, same old. But there is a Festival. The Festival del Fundraising took place this year on the shores of Lake Garda, near Verona. With 650 participants it was bigger this year than ever before, and it launched the festival mood with “Fundraiser’s Got Talent” an opening session in full Italian TV-show style. This is a young and growing fundraising market with a strong backbone of training, thanks to the Masters in Fundraising offered by the University of Bologna. This year there was an invited group of students from the Columbia University MSc in Fundraising Management, so the conversations in class and around the bar were cross-cultural: everyone learned from each other. Italy’s NGOs, universities, arts and cultural organisations are increasingly looking to fundraising for growth. The Italian state is cutting back, and there is a hunger for doing more and better. Leading NGOs have focused in the past on direct mail marketing but many are developing DRTV and new media methods, and a few are focusing on strategic (major) donors. Why so large? Principally thanks to a handful of mega-foundations created when the Italian Government split the huge regional savings banks which had previously carried out a mixed banking and social role, into banks, and foundations. Thus the Fondazione Cariplo has €7.7 billion in assets, while Fondazione CRT, built from the old savings bank of Turin has €2.2 billion. These huge foundations are relatively easy to find but the rest of the sector remains a mystery. 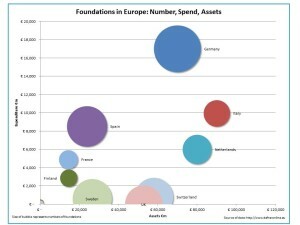 There are thousands of foundations in Italy including family and church foundations which are almost completely invisible, and certainly do not have the type of glass pockets that would be expected amongst US or UK foundations. The lack of transparency amongst strategic donors was a common theme in the conference – many donors do not want their name published nor their gift known. There are many reasons for this including, according to one speaker, the Catholic culture of separating philanthropy from the rest of one’s public life. This tendency to secrecy has been exacerbated by a new tool being used by the Italian tax authorities for measuring individual wealth: part of the measure is how much you give to charity. If you give a lot it is assumed that you have a lot, and people of wealth are concerned that this will mean they end up paying a lot more tax. There are also problems of recruitment in this young and growing market. In the strategic donor area there are very few fundraisers with experience of strategic donor or foundation work, and almost none with prospect research experience. Setting up a team involves difficult choices between waiting to recruit someone experienced or training a newcomer. Salaries in the sector are still modest and so it is especially hard to recruit people with experience from relevant commercial sectors such as finance and banking. The strong foundation of the Master in Fundraising at Bologna combined with a sector that wants to grow and the enthusiasm of hundreds of Italian fundraisers means that this is an exciting development market for fundraising. It is now time for the philanthropic sector to respond by moving toward a modern, transparent, accountable style of giving. Then we can have a real festival of fundraising. Thanks to Columbia University and Valerio Melandri at the Festival del Fundraising / University of Bologna for the opportunity to speak at this event. 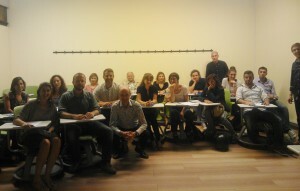 Factary is active in Italy, where we have carried out research, training and consultancy assignments for leading NGOs. This week there are two significant training events for Factary. Today, Tuesday 8th October, Factary’s Chris Carnie is helping to launch the new Postgraduate Certificate in Fundraising at the University of Barcelona. The course runs over an academic year (November to June) and covers the skills and techniques required to be a fundraiser, with a focus on practical tasks and actions. We’ve got a range of great speakers and trainers taking part, from NGOs, cultural and arts organisations, campaigning organisations, the health and foundation sectors. Find out more, and register, here. And on Thursday, Will Whitefield and Chris Carnie are giving a webinar with APRA on prospect research in the UK. “An Island of Information“ is aimed at researchers and fundraisers outside the UK who want to understand the market here. Find out more, and register, here. Factary’s Chris Carnie is part of the planning team for a brand new certificate in fundraising at the University of Barcelona. The new course (http://www.il3.ub.edu/es/postgrado/postgrado-captacion-fondos-fundraising.html) runs from November 2013-April 2014. It has a great team of tutors, including the Director of Fundraising at MSF Spain (Médicos sin Fronteras) Anna Pineda, and the director of one of the most innovative nonprofits here, Oriol Alsina from Fundació Amics de la Gent Gran. We’ve also got Juan Mezo, ex Marketing Director at Oxfam now at Valores y Marketing, and Miquel de Paladella, from SIC Social Innovation for Communities. The course is focused on real-life practice – so it includes sections on how to ask, on understanding the market, on face-to-face and on innovation in fundraising. Join us for this great new course, or tell your friends in Spain about it! Due Diligence: can you accept that donation? In December 2008, London School of Economics approached Saif Gaddafi, son of the Libyan leader Colonel Gaddafi, for a donation. On the 23rd June 2009, the governing Council of LSE agreed to accept a gift of £1.5m from a group of companies in Libya, channelled via the Gaddafi International Charity and Development Foundation, controlled by Saif Gaddafi. This story emerged in the media only after the uprising against the Gaddafi regime began, in February 2011. LSE was attacked in the UK press for having accepted the gift and the controversy grew so severe that by March 2011 the Director of the LSE Sir Howard Davies resigned. The LSE Council later funded an independent enquiry led by Lord Woolf. As Lord Woolf’s report makes clear, all this was in the historic context that at the time when the gift was being considered, Libya was being seen as a potential friend by the West. The UN Arms Embargo against Libya had been lifted in 2003 and the Bush administration had removed Libya from the list of countries that sponsor terrorism in 2007. The Colonel had been met by Tony Blair in an official visit in 2007; the then Prime Minister saw Gaddafi as a potential ally. In 2009, Libya was seen as eccentric but progressing steadily in the right direction. But just two years later the Colonel had become a reputational risk for LSE. The School’s reputation had been damaged, and the Director’s neck was on the block. It shows how fast reputations can change. Your celebrity donor today can tomorrow be vilified because he has been caught, literally, with his pants down. Due diligence today is useful, but it is only of any value if it is a continuous, reviewed process. It shows how hard it is to measure reputational risk where there is complexity. This gift was supposed to come from a consortium of companies, in a country in which little or no corporate transparency exists, channelled via a foundation led by the son of a dictator. Complexity makes due diligence difficult. But major donors often lead complex lives and make gifts via complex structures. Just what are we measuring? What, in the case of the Colonel, was LSE supposed to be measuring with its due diligence work? The Colonel’s reputation with the politicians? His son’s reputation? The ways in which his wealth had been accumulated? Clarity in understanding what we are attempting to measure is a key part of due diligence work. So, what is Due Diligence? Due diligence is used in the context of “doing a thorough job of checking a prospect.” Up to now most of the focus in due diligence work has been on companies. But fundraisers are now asking for due diligence research on individual philanthropists, wherever there is a concern that reputations or finance could be at stake, or where there is a moral issue to untangle. 1. Is he who he says he is? At Factary we were asked this recently. A man who said he was a Vicomte had been in contact with the nonprofit and there was talk of a very large gift, possibly into the millions. The nonprofit had started to cultivate the relationship with meetings and social events. The nonprofit’s in-house researcher was suspicious and asked us to carry out a due diligence check. It was difficult because he had covered his tracks well, but eventually we demonstrated that he was definitely not a Vicomte, definitely not French, and that lived in a very small house in Peckham. There were hints that he had done this kind of thing before, although no public reports of convictions. We reported our findings to the nonprofit who stepped away from the relationship. Proving that a person is the person that they claim to be is difficult – you don’t normally ask potential donors for their passport or ID card – but it’s an essential part of due diligence. 2. Is there money, really? Does she have the money – a key question for fundraisers – should also form part of a due diligence process, just as it would if you were a business and about to take on a new customer. This means researching wealth and income, shareholdings and properties. The origins of the funds to be donated are researchable…in some cases. There are geographic limitations (I have tried, and failed, to identify the source of wealth of certain Russian oligarchs) and there are historic limitations (how far back do you really want to go? The source of her money? Or of her grandmother’s fortune?). This is the slippery, difficult-to-define word of the due diligence researcher. We can research reputation in the press and media (but is that not a very biased source? ), we can research the circle of contacts that a prospect moves amongst, and we can ask people-who-know-people for their opinions. There is much about donors that we cannot check. Thankfully, most of us have lives that are private. We can’t check on money held in banks – it’s private. We mostly can’t check wealth held through private trusts, or wealth held in certain jurisdictions (try the Netherlands Antilles, for example…) We can’t tell whether someone’s secret sexual activities will, tomorrow, be the subject of long-lens photo-“journalism” or of a kiss-and-tell story in the yellow press. You are simply not allowed to store defamatory material on people. So how are you going to record the (reputational risk-related rumour) that he was a diamond smuggler in his youth? Nor can you store information on sexuality, health or religion. Any of these could, in some organisations, imply a reputational risk. Those of us in prospect research live with clear ethical guidelines (see the Association of Professional Researchers for Advancement). For me, for example, this means that I am not willing to use private detectives or false “survey calls” to source information on philanthropic prospects. The first is too intrusive and the second is, simply, lying. In real-life fundraising we face other issues. For example, if the Director General says we should accept the money, what do we do? Do we stick to our agreed due-diligence procedure? Or does the DG’s political power mean that we take the money despite our concerns? There are no perfectly satisfactory answers to these questions. But we were in the same place over the issues that arose from starting prospect research 20 years ago. In time we will together build the protocols and sector norms that we need to enable us to do a good job of being duly diligent. Now, we need the debate. Factary’s Chris Carnie will be running a workshop on Due Diligence and Major Donors at next week’s International Fundraising Congress Noordwijkerhout, Netherlands. Posted in Chris Carnie's Blog, Fundraising Research, TrainingTagged due diligence, ethics, research5 Comments on Due Diligence: can you accept that donation? Is your donor clean? Meaning – would you accept a donation from them? We are used to carrying out due diligence research on companies, but now there is the challenge of how to do this for individual philanthropists. I’ve written a piece on this for Reinier Spruit’s 101Fundraising blog, and will be giving a workshop on Due Diligence and Major Donor’s at IFC later this month. Martine Godefroid, Managing Director of Factary Europe, gave a seminar on major donor fundraising at the Belgian National Fundraising conference on 5th April 2011. Martine’s seminar focused on defining, understanding and approaching strategic donors, and included a valuable overview of the situation of individual philanthropy in Belgium. Chris Carnie will be chairing a session at the Institute of Fundraising’s Major Donor Fundraising conference in London, 7th February 2011. Full details on the conference are at the Institute of Fundraising website. Chris Carnie’s presentation at the Researchers in Fundraising Conference, London, 1st November 2010, is available here.